I love you more then you’ve ever really understood. When people ask me who I am, I proudly say I am Chinese American. And, while I may not be that great at being Chinese American — I don’t speak Mandarin very well, my Cantonese is worse, and yes technically I am Chinese Canadian — you’ll tease me for it, but you’ve never truly held it against me. My whole life, I’ve associated you with honour; with respect; with dignity; with discipline; with intelligence; and above all, with love: love for one’s parents, one’s children, one’s elders, one’s friends, one’s community. And that’s why I’m so disappointed right now. That’s why I just don’t understand why you’re saying the stuff you’re saying. Like you, my mom and my dad immigrated to North America. They left home before I was born to come here, with nothing but college degrees, a couple hundred dollars, a mattress to sleep on, and a dream. Many immigrants dream of the Golden Mountain. My mom’s dream was of me. She dreamed of coming here; to have kids like me and my sister; to give us an education; to give us a happy childhood; to give us a life. More simply, she dreamed of opportunity — a fair chance to prove what she was capable of, and to give that same opportunity to us. And that’s what affirmative action means. It means opportunity. About forty years ago, Asian Americans were underrepresented minorities in North America. When my parents first came to North America, there was strong racism against Asians, and it was really hard to land a job as a fresh immigrant from Asia. Being an immigrant meant you didn’t have the same skillset as people trained in North America — you couldn’t speak English as well, you might not be able to type as well, or answer phones as well. On paper, there were many reasons why you might not appear to be as qualified as American candidates, or you might even not score as well on standardized tests. Immigrant kids tend to get lower grades in English or in exams that are administered in English: but that’s because they are ESL kids, and not because they aren’t trying as hard as English-speaking American kids. And some people were also just plain racist. Because of these inherent problems, 40 years ago, Asian Americans (and particularly Chinese Americans) were huge beneficiaries of affirmative action programs — in colleges and in the work force. In the 1960’s and 1970’s, colleges and employers were recruiting and admitting Asian Americans, as well as Blacks and Latinos and others, under (among other programs) race-based affirmative action policies. My dad’s first job was with a major software company, and he got it because he was highly skilled in programming, and also because the company was looking to hire Asian employees (to eventually break back into the Chinese market). My mom arrived in North America without being able to speak a word of English. Her only marketable skill (she’s a trained entomologist in insects native to Taiwan) wasn’t marketable here. She had a much harder time then my dad finding her first job in North America. Because she couldn’t speak English, she couldn’t read or write in English, she couldn’t type, and she couldn’t answer phones, she couldn’t compete in any quantifiable measure as a job candidate. Finally, one job gave her a chance — and again, it was in part because of affirmative action. Thanks to an employer who was willing to give my mom the benefit of a doubt and hire her despite her non-existent English language skills, she was able to land her first job as a secretary, where she learned to type as well as some basic English. From there, she was able to eventually land a second job — again, in part through affirmative action — where she eventually was able to teach herself programming and (many decades later) become head of IT. My parents are immigrant success stories. They came to North America with nothing, and worked their way to upper middle-class, because of hard work, sweat and tears; but they are also immigrant success stories because they were given the chance by affirmative action programs to prove what they were capable of. Affirmative action programs looked beyond the quantifiable impacts of my parents’ race, their class, and their language skills had in reducing their on-paper credentials. Affirmative action was America’s assurance that my parents would have the opportunity to compete, even if they were starting from an unequal starting position. I can trace my own successes as a child and an adult to both my parents’ hard work, sweat, and tears; but also to how affirmative action programs helped my parents apply those characteristics. Thanks to everything my parents had to endure — as well as the programs that helped them compete in face of racism and classism — I’ve had the privilege of a comfortable childhood, great schools, and a budding career, and I couldn’t be more thankful to my parents for it. 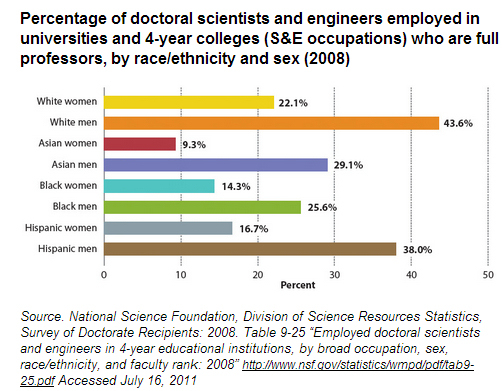 Sadly, the playing field still isn’t level everywhere, even for Chinese Americans. I’ve written previously about biases that limit advancement of Asian Americans to faculty positions and higher; affirmative action policies today continue to consider the racial identity of underrepresented Asian Americans, as well as other minorities, when making faculty hires and when applying promotions in private companies. Affirmative action programs today continue to benefit Asian Americans seeking jobs and trying to break through America’s bamboo ceiling. Affirmative action has been historically critical for Asian Americans, including Chinese Americans, to give us the opportunity to prove ourselves, and continues to be necessary for us now, even though our numbers on some college campuses suggest that as a community we may no longer be severely racially (though we may still be class-based) excluded from accessing a college education at those schools. Arguably, we (middle-class Chinese Americans) have largely “made it” when it comes to breaking into college admissions; but in other areas, we still need — and benefit from — affirmative action programs. Affirmative action is also necessary for many other racial groups to make gains. Precisely because I understand exactly how much the opportunity my parents had access to has resulted in success for my family, I want to protect that opportunity for others. Unlike my parents, most Blacks, Latinos, Native Americans and Southeast Asian Americans didn’t have the benefit of a college education earned overseas to kickstart a career as a new immigrant in America. Many of these underrepresented minorities (URM) don’t live in states like California or New York City — or in affluent local neighbourhoods within these states — where localities invest in public education. In the neighbourhoods where many URM kids live, public schools are treated less like places of learning and more like centers where students are placed in a holding pattern until they are 18, where many are sabotaged — often by their own teachers or guidance counselors — by the wrong-headed idea that all they should look forward to is a minimum wage job or jail. There is virtually no access to textbooks or school supplies; there is a dearth of energized and talented instructors; public libraries are underfunded and falling apart; and the notion of AP courses and extracurricular activities are a joke. And, this happens even in middle-class predominantly-URM schools that receive far less resources than predominantly-White schools in the same school district (thus nullifying issues of class). At every turn, America has denied URM kids the tools they need to achieve academically, and they have done this in part because of these kids’ race. Yet, we blame deficiencies in work ethic or intellect when URM students don’t perform as well on standardized tests, not racism. We fault them for scoring less well on “objective” measures of aptitude (while ignoring the evidence that these “objective” measures are anything but), rather than to be monumentally impressed by the work ethic it takes to score 90% as well when armed with 25% of the resources of others. If Chinese Americans value hard work, how can we not value this? 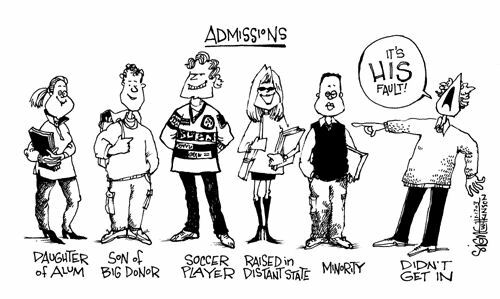 If a Chinese American didn’t get into their college of choice, why do we assume the URM kid who did must have been “less qualified”? How can we, Chinese Americans who have benefited so dramatically from affirmative action, and who have used those afforded opportunities to prove ourselves and pass that success on to our children, now turn around and say that other beneficiaries of affirmative action today are less qualified by virtue of benefiting from affimative action programs? My parents weren’t unqualified when they were hired over White competitors; but they needed affirmative action to get the opportunity to prove that fact to their employers. Since the passage of Proposition 209, our current metrics in California of assessment for college admissions assumes equal access for all high school students to necessary resources where none exists. Our current system rewards high school students who — through a combination of both hard work and opportunity — perform well on “objective” tests; and punishes other high school students who underperform predominantly due to the lack of opportunity and resources. Our current system is the appearance of a level playing field when it’s clearly not. Instead, our system is one that protects advantaged kids from having to compete in a levelled playing field against disadvantaged kids; it is a system that reinforces the denial of opportunity — opportunity that has been so critical for Chinese Americans — to others. And some Chinese Americans have positioned themselves to defend this system. 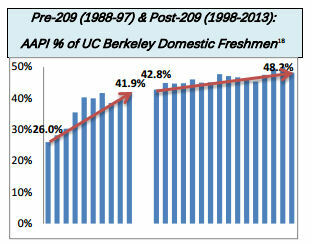 SCA5 does not implement racial bias into college admissions, as affirmative action didn’t do prior to Prop 209. It will not deny Asian Americans access to college, as it didn’t do in the early 1990’s, when Asian American admissions was at 42% (nearly three times their state-wide population), and had risen at a faster rate then it has since the passage of Prop 209. SCA5 will revert UC college admissions to the pre-Prop209 process: a holistic review system that includes race as one of over 900 factors to assess students, to ensure that URM high school students can fairly compete despite having access to fewer educational tools and resources. It is a system that, in essence, gives a URM applicant a teeny tiny bit of credit for having done more with less. It is a system that is currently employed throughout the country to fairly admit thousands of Asian American students to elite colleges, and into classrooms also populated by highly competitive students of other diverse backgrounds. SCA5 won’t let unqualified URM kids skate by, no more so then affirmative action gave a pass to “unqualified” Chinese Americans. SCA5, and race-based affirmative action gives URM kids who have overcome to the best of their abilities the institutionalized iniquities that persist into today, the opportunity they need to excel at college. And, the results may surprise you: at elite private universities, where race-based affirmative action is practiced, the graduation rate of Black students approaches 100% and is steadily improving in other universities. When given the opportunity to prove what they are capable of in a college setting, URM students are demonstrating that they have the exact same work ethic and intellect as their Asian and White peers (even as the nation is slow to recognize it). As a Chinese American student, I have learned as much from my peers as I have from my teachers. Inviting hard-working and qualified URM students — who otherwise have limited access to a college education — isn’t just beneficial to these communities. Access to college through affirmative action programs won’t just benefit communities like Southeast Asian Americans where 85% of adults haven’t had access to a college degree. As a Chinese American, being able to learn alongside kids who are different from me has made me a better student, has taught me how to think abstractly and critically from divergent perspectives, and has better prepared me for a globalized international world. Studies have shown time-and-time again the value of classroom diversity on quality of education, and yet we Chinese Americans continue to oppose these measures that would strengthen the quality of college education for our kids. As a Chinese American who has had a chance to learn in a diverse classroom, I have been forced to think outside of my own narrative and my own self-interests; insodoing, I have become a smarter, better, more caring person who is well-equipped to tackle all the challenges the world will throw at me. In the end, I think that’s what my mom was dreaming of giving me in the first place when she came here. 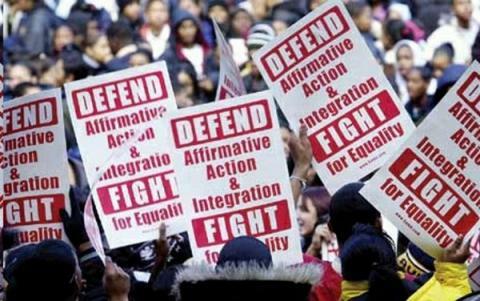 Affirmative action is a complex topic and an imperfect solution. It is not a panacea for racism, and shouldn’t be debated as such. But affirmative action, as it would be restored by SCA5, should be implemented alongside measures to improve general federal and state-wide investment in our schools and our students. Neither solution is likely to alone reverse the impacts of racism and classism on our fellow Americans; together, they are a good start. SCA5 should be recognized for what it is — a chance given to people the system has failed. 40 years ago, those people included us. As a Chinese American, I believe strongly that our community is better than this. I believe we are not the self-interested and misinformed voters they are making us out to be. I believe in Chinese American principles of love, caring, and sacrifice: not just for ourselves and our children, but for our entire community. I believe it is our selflessness, not our selfishness, that defines us. I’m asking you, Chinese America: please remember how important the opportunities afforded to us by affirmative action programs have been to us and our families, and how we have through hard work converted those opportunities into success. Please don’t stand in defense of a system that would deny those same opportunities to others.